Webscape, a website dedicated to landscapes? Yes in a way. As I realized that most of my fields of interest gravitate around the concept of landscape, I wanted to share them with you in this webscape: a couple of personal sceneries in our huge cyberspace. My name is Luc Sorel. Born in France from a painting-pharmacist mother and a geologist-researcher father, my elderly brother and I grew up in a somewhat scientific atmosphere, although surrounded with creative influences and sensitivity toward the environment. For more details about my professional skills and experiences, you may want to have a look at my my resume (in English, or in French) or contact me. Click the link to download my resume (PDF file in English). 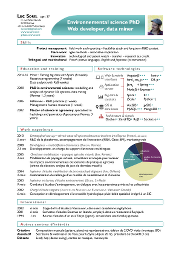 Cliquez pour télécharger mon CV (fichier PDF en français). What kinds of landscape can you find here? Since my father is a geologist working on Greece tectonics, I started traveling very early, and I have really never stopped. Whenever I could, I chose to experience parts of my education and work lifes in an international environment rather than traveling as a tourist, thus allowing longer and better interaction with local people and culture. However, you can find some landscape pictures in the travels page, ranging from Japan, to Iceland, through Canada. For the moment, I am a PhD candidate working on a research project where I design and implement Qualscape, a virtual landscapes plateform whose goal is to provide new scientific methods to assess the environmental impacts of long-term and large-scale agricultural practices. This 3D and dynamic engine focuses on soil and water quality by considering the interaction between fertilization practices of the farmsteads, crops, soils, and water fluxes from the sky to the water bodies (aquifers, rivers). I started playing music as an exchange student in Tokyo Oizumi High School, and playing music with my Japanese schoolmates helped me so much to integrate in a new cultural landscape that, since that year, music has kept for me its ambivalent nature of being an inner universe of self expression, and a stimulating network between musicians. Of course, musical soundscapes are enjoyable not only by musicians, so go to the multimedia page to discover some of my creations! Virtual landscapes also refer to the virtual worlds where people can feel or express emotions, interact, and collaborate. These realtime interactions are possible mainly thanks to the development of internet- or computer-based technologies; and they are developped mainly for entertainement (movie special effects, video games) and cyberspace activities (social network, project management). Such interactive cyberspaces also contributed to the development of highly structured OpenSource projects (such as Linux, Firefox and OpenOffice.org). Being an active member of the OpenSource ecosystem, I propose some OpenSource resources on the downloads page. Feel free to use, distribute and feedback those tools. Luc Sorel's PhD thesis defense on 16.06.2008. I am the webmaster of 'Tous pour la Syrie', a non-profit association based in Rennes (France, Brittany) dedicated to providing humanitarian aid to the Syrian people and develop friendship between French and Syrian people. On March 23rd 2010, I gave a presentation to illustrate the best practices for architecting GWT professional applications. It is based on the Google 2009 international conference done by Ray Ryan and on the gwt-mvp library writtin by E. S. Nunes. I have recently joined Jackalope, a rock band based in Rennes (Brittany, France). We have just launched our official website on which you can listen some songs we play, be informed of our gigs, etc. I will defend my PhD thesis on Monday 16th June 2008, 2:00pm, at Agrocampus-Rennes. My thesis is about "Virtual landscapes and scenario analysis to assess the environmental impacts of agrosystems". The defense is open to the public. Subscribe to Webscape's news feed! Last update of the home page: 03 April 2016-19:09. Design elements from FamFamFam and NodeThirtyThree.